The modelers at FiveThirtyEight have made a compelling case that we should expect Republicans to pick up a seat or two in the upcoming U.S. Senate election. The purpose of this post is to show that this is essentially the same prediction we would have made two years ago, once we knew a Republican would be president at the midterm. Before launching in, I must do my political science duty by recommending a symposium on election forecasting that appeared in the October edition of PS: Political Science and Politics. You can access that symposium by clicking here. In the interest of brevity, I am leaving aside the intellectual justifications for the two simple predictive models I will use here. 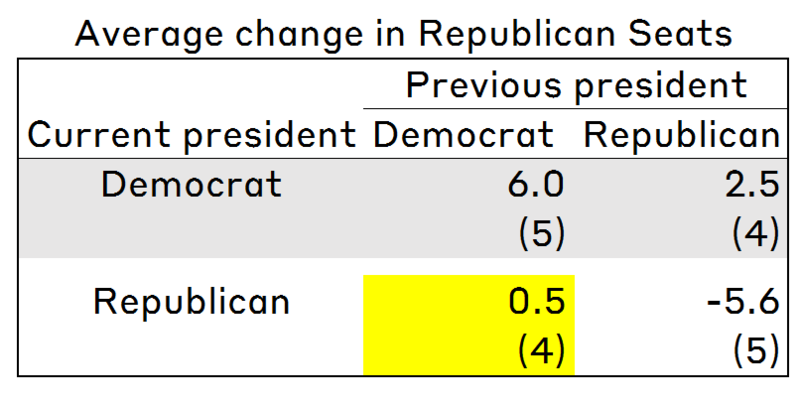 The first model, the presidential partisanship model, predicts the net change in seats experienced by the president’s party at midterm by taking into account (1) the party of the president who won when the current class of senators was last elected and (2) the party of the president at midterm. The second model, the seats-at-risk model, substitutes the number of seats held by the incumbent president’s party for the party of the president who won the last time this class of senators were up for election. The presidential partisanship model focuses on the role of the president in driving outcomes of national elections. It is obvious that we would take into the account the party of the incumbent president in predicting the outcome of a midterm Senate election, because midterm elections are always, in part, a referendum on the incumbent’s performance. We take into account the party of the previous president because the class of senators running for reelection in a midterm were last elected when the previous president was on the ballot. For 2018, Republican Senate candidates are disadvantaged by the fact that the incumbent president is a Republican. This would be true if the Republican were named Donald Trump or John Kasich. Since 1946, Republicans have lost an average of 2.9 seats in the Senate when the president at midterm has been a Republican, compared to gaining 4.4 seats under Democratic presidents. At the same time, Republican Senate candidates in 2018 are helped by the fact that the class of senators up in 2018 was last elected in 2012, which was a moderately good Democratic year — Barack Obama was elected president, Democrats picked up a net of eight seats in the House, and picked up two seats in the Senate. 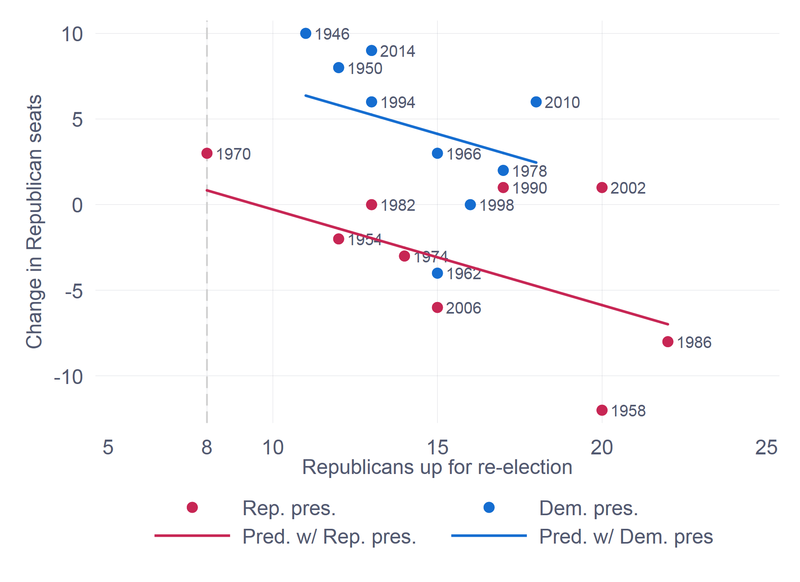 Since 1946, Republicans have gained an average of 3.6 seats in the Senate when the previous president was a Democrat, compared to losing 2.0 seats when the previous president was a Republican. We can put these two factors together. The accompanying table shows the average change in Republican Senate seats since 1946, based on the party of the current and previous president. The cell colored yellow is the one relevant to 2018 — Republican incumbent and Democrat previous president. Note that the average change in Republican seats under these circumstances has been half a seat, which is essentially the same as FiveThirtyEight’s prediction of 0.8 as of this morning (Sunday before Election Day). The seats-at-risk model can be thought of as modifying the presidential partisanship model in one important way. 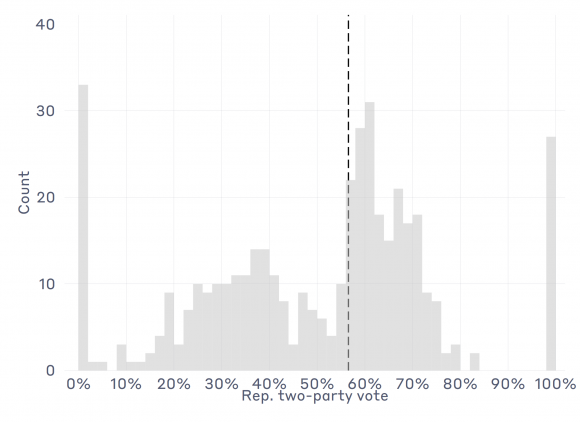 Rather than just noting the partisanship of the previous president, we can note how much of a boost to that president’s party was experienced in the senatorial election. It is reasonable to expect that Senate candidates swept into office on the coattails of a presidential candidate will do worse the next time the president is not on the ballot. If the president has long senatorial coattails, that means the number of vulnerable Senate seats will be greater six years later (without the same president on the ballot) than if the coattails were short. The numbers bear this out. Since 1946, 14.7 Republican seats have been “at risk” in each midterm Senate election. In elections with more than 14 seats at risk, Republicans have lost an average of 1.7 seats; with fewer than 14 seats at risk, they have gained an average of 3.9 seats. Not surprisingly, controlling for seats at risk, Republicans have done better when the incumbent president was a Democrat than when he was a Republican. One way to illustrate this is in the accompanying figure. 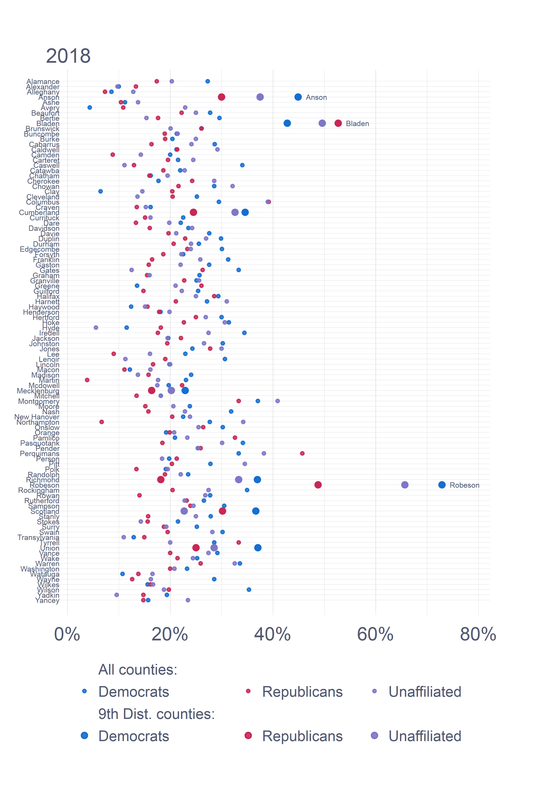 The figure is a scatterplot that shows the net change in Republican seats plotted against the number of Republicans up for re-election. Red circles are midterms with Republican incumbents; blue circles have Democratic incumbents. The two lines are simply the result of fitting a linear regression through the data, with a dummy variable indicating whether the incumbent president is a Republican. This graph illustrates the two major features of the seats-at-risk model. First, fewer Republicans up for re-election are correlated with more Republican gains in the Senate. 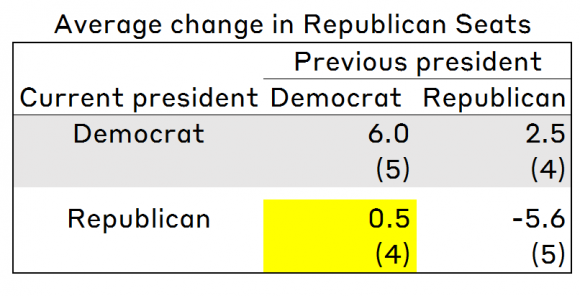 Second, Republican presidents at midterm are associated with smaller gains/bigger losses. On the x-axis I have indicated the number of Republican seats up for reelection in 2018, eight. Note that the point prediction of the change in Republican seats in 2018 is a pick-up of 0.8, precisely what FiveThirtyEight is predicting today. The point of this posting has been to provide a bit of historical context to the most likely outcome of the upcoming Senate election — Republicans might pick up a seat or two. These models — and the much more sophisticated ones that one can read in the political science literature — don’t need to know anything about the factors that are currently the subject of so much discussion, such as the unpopularity of the president, political polarization, the mobilization of the resistance, and the counter-mobilization of the President’s base. There are two things that this posting is not. First, it is not a dig at more sophisticated models, such as one finds in the political science literature or on websites such as FiveThirtyEight. In fact, it’s just the opposite. The value of these more sophisticated models is that they allow us to probe generic “fundamental” expectations in more depth. Second, this posting is not an effort to argue that campaigns don’t matter, or that current political activism doesn’t matter. Yes, as I’ve noted, it’s possible to generate plausible predictions about the outcome of the 2018 Senate election without any reference to any “real world” politics. But, it’s also important to note that these simple models work because they are characterizing a political system that is in a type of equilibrium, such that when one set of conditions is met — for instance, a Republican incumbent is in place at midterm following a Democratic president — the political environment shifts in predictable ways. Those working pieces are difficult, if not impossible, to model with a high degree of confidence. That’s why we work with the simpler models. We won’t know whether these predictions work out until all the votes are counted, which won’t be until the days and weeks following Election Day. We can be certain that the actual results will deviate from the predictions, at least somewhat. But, I’m also feeling confident that the analytical tools at our disposal will help up to make sense of what can sometimes seem like chaos. This entry was posted in Uncategorized on November 4, 2018 by cstewart. 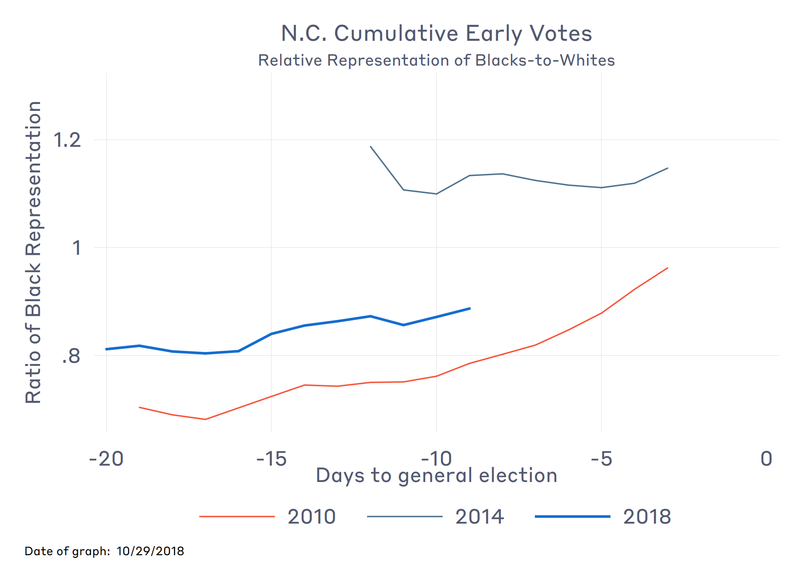 The number of people voting early, in person, in North Carolina — what most of the country calls “early voting,” but what North Carolina calls “one-stop absentee voting” — has exploded in 2018. (For this post, I will use the more common term “early voting” to refer to North Carolina’s one-stop process.) As of last weekend, over 1.1 million Tar Heels had cast an early vote, which is essentially the total number of people who cast early votes in all of 2014, and roughly three times the number of early votes cast at comparable times in 2010 and 2014. Two things make this interesting. 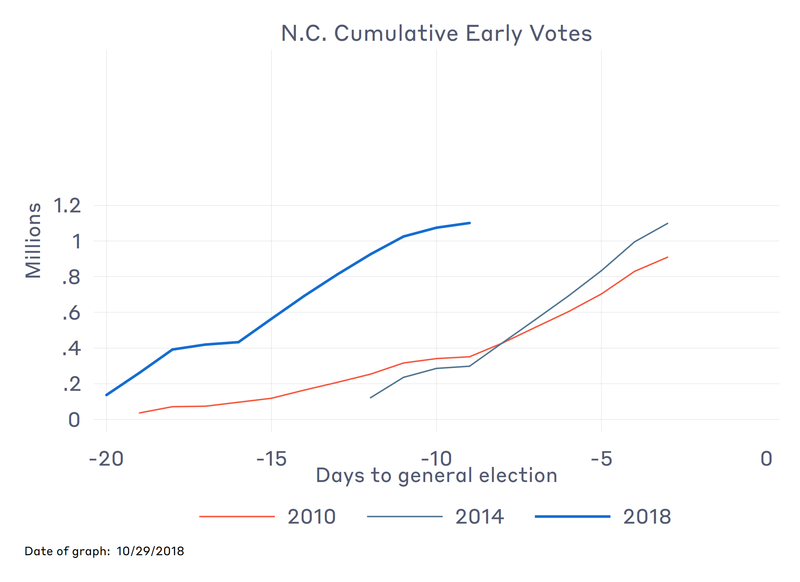 First, in most states, North Carolina included, early voting has been a presidential-year phenomenon, with early voting rates falling back in midterm years. For instance, in 2012 56% of all North Carolina ballots were cast early; in 2014, that fell to 37%. In 2016, 60% of ballots were cast early. That would lead us to believe that something like 40% would be cast early in 2018 under normal circumstances. Let’s say that a total of 3.5 million North Carolinians will vote this year, which is a 20% increase over 2014, and in any other year would be an outrageous prediction. Forty percent of 3.5 million is 1.4 million early votes. We’ve nearly achieved that number, and we’re more than a week away from Election Day. 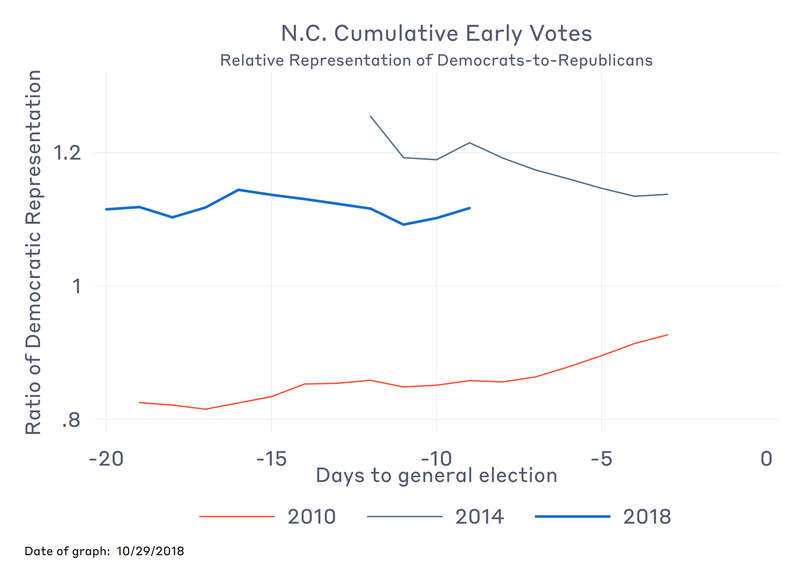 The second reason the surge in early voting is interesting is that North Carolina is not on the national radar this year. Its statewide offices are elected in presidential years, and neither U.S. Senate seat is up this cycle. 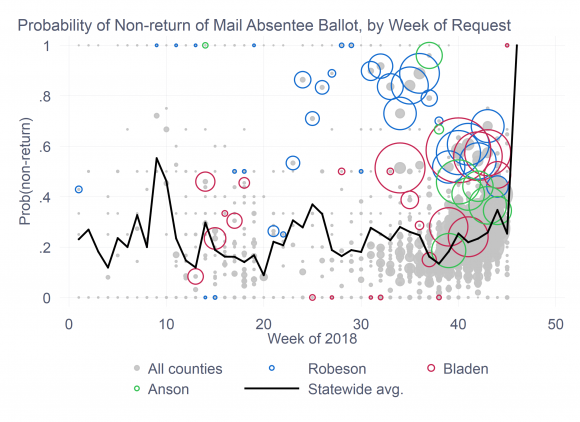 Conventional wisdom has held that up-ticks in convenience voting — early and absentee voting — are typically driven by the campaigns, especially the national campaigns. 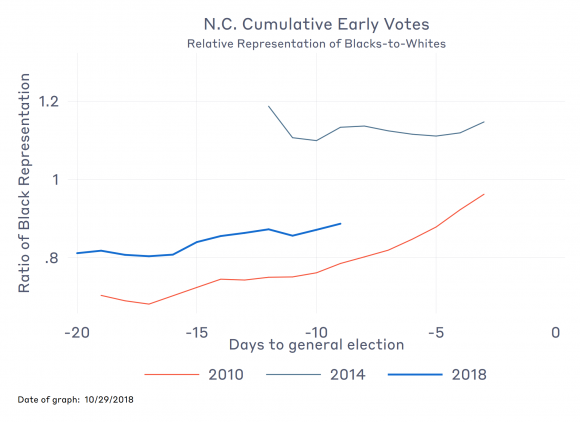 The early voting surge in North Carolina is driven entirely by what’s happening in North Carolina, not by the mobilization efforts of the national campaigns. This is interesting. To return to the data, the accompanying graph shows the cumulative number of early voters at comparable points in the pre-election periods of the three most recent midterm elections. (As always, click on the graph to enlarginate it.) The cumulative number of early votes for each year are plotted against a comparable “countdown to election day.” The three lines all start at different places along the x-axis, reflecting how the General Assembly has altered the early voting period over the past five years — reducing it by a week for 2014 (later struck down by the 4th Circuit) and then adding a day for 2018. As of yesterday, the preliminary count is over three times greater than at a comparable time in 2010 or 2014, and has already surpassed the number of early votes in 2014. What about party and race? The total number of early voters is of interest to election geeks, both those interested in election administration and those interested in campaign mobilization. What about the politics of the numbers we see thus far? Trillions of electrons are currently being spilled, trying to divine next week’s election outcomes based on the early vote totals. In North Carolina, at least, and probably elsewhere, that’s a fool’s mission. At best, the early vote numbers, broken down by party, are only weakly predictive of the final election results. 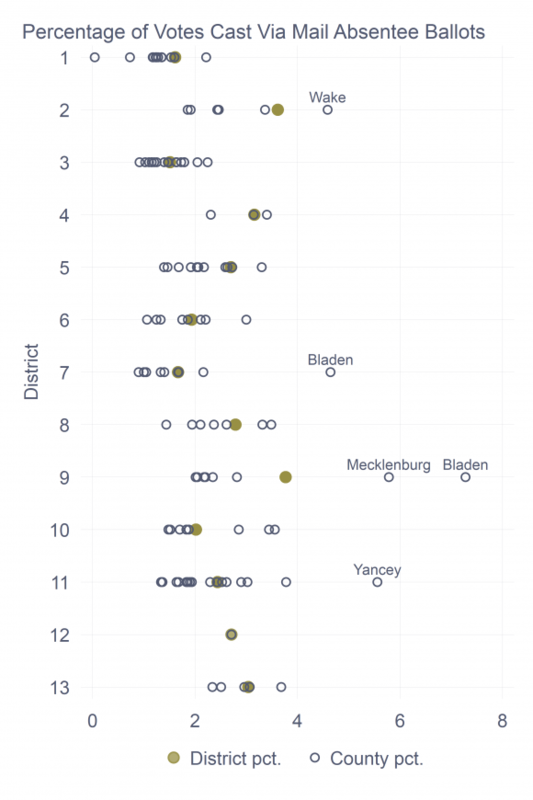 Nonetheless, part of the discussion about early- and absentee-voting numbers revolves around the types of voters who gravitate toward these modes. With that more minimalist perspective, what do the North Carolina numbers tell us? Let’s start with party. 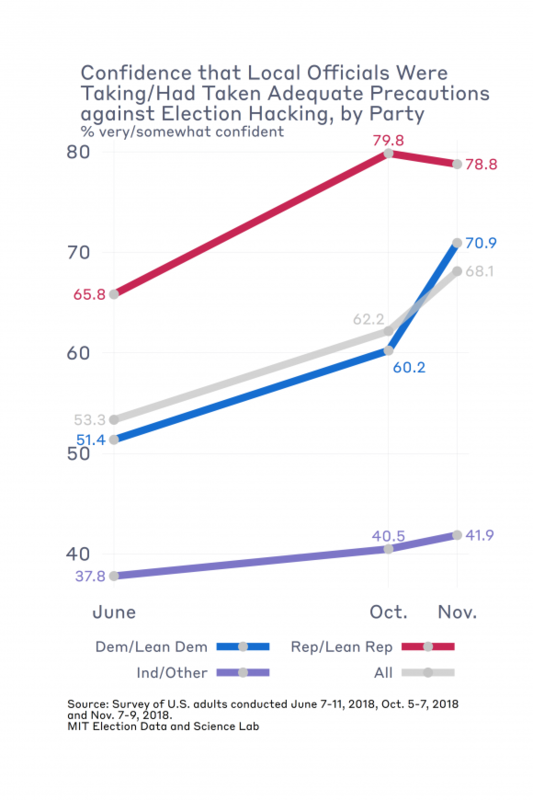 Are Republicans or Democrats more likely to avail themselves of early voting this year? 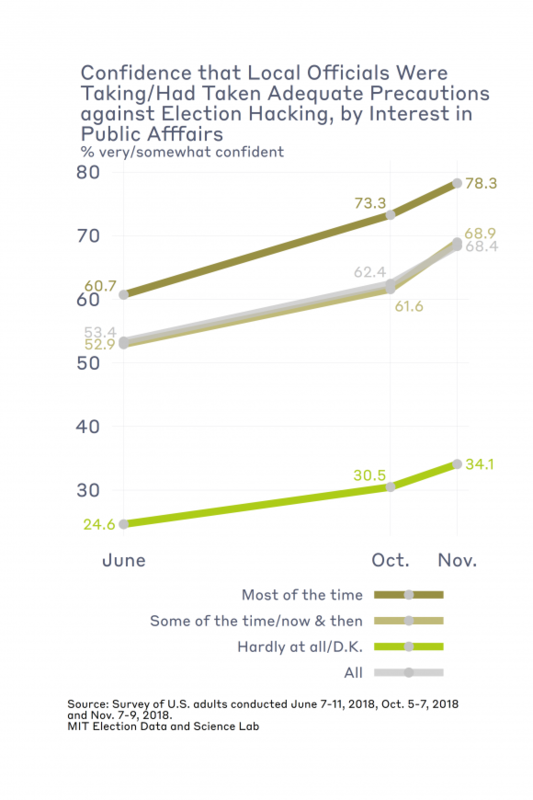 Thus far, Democrats are more likely than Republican to use early voting, relatively speaking. However, compared to 2014, the disproportionately greater use of early voting by Democrats has declined. 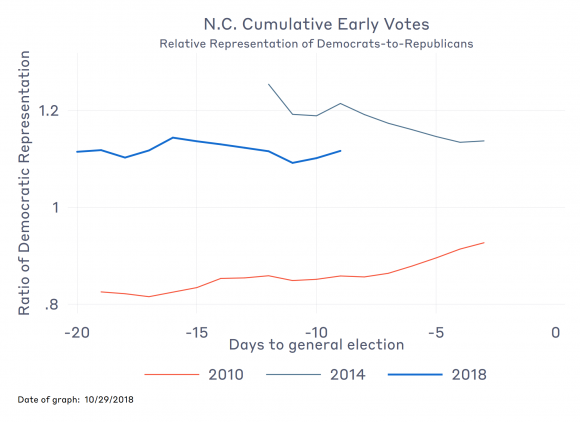 Thus, the surge in early voting in North Carolina is being driven more by the surge of Republicans than the surge of Democrats. As of yesterday, approximately 473,000 Democrats and 333,000 Republicans had voted early, which puts the Democrat-to-Republican ratio at 1.42:1 among early voters. 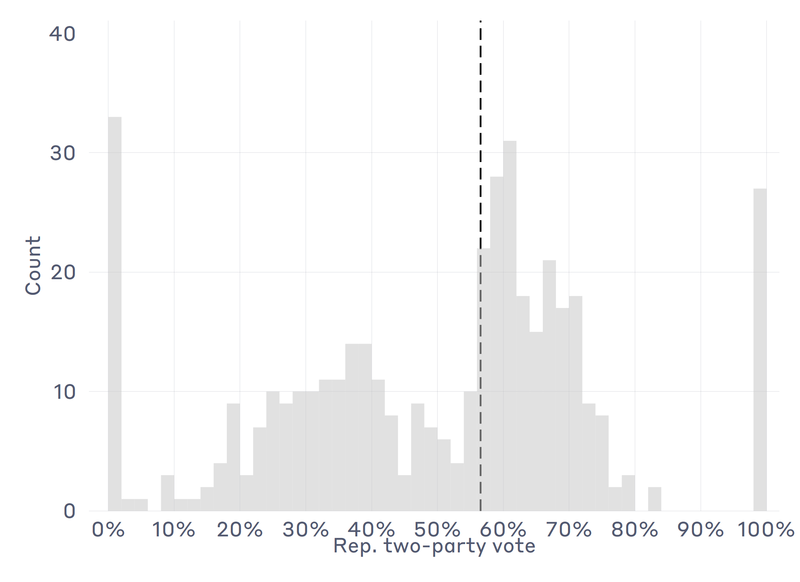 This party ratio in the use of early voting needs to be compared to the Democrat-to-Republican ratio among registered voters, which is currently 1.27:1. Because 1.42 is greater than 1.27, we can say that Democrats are disproportionately using early voting. But, hold that thought; we’ll come back to it.. The accompanying chart shows how the ratio of Democratic-to-Republican early voters has played out in 2018, and in comparison with 2010 and 2014. The blue line in the graph essentially reproduces the calculation I performed in the previous paragraph for each day of early voting this year. It takes the Democrat-to-Republican ratio of early voters and divides by the Democrat-to-Republican ratio of registrants. Numbers greater than one indicate that early voting is being used disproportionately by Democrats; numbers less than one indicate early voting being used disproportionately by Republicans. Note that this “ratio of ratios” measure has been quite different in 2010, 2014, and 2018. In 2010, early voting was used disproportionately by Republicans, although there was a significant surge of Democrats toward the end that brought its use into something closer to parity. In 2014, early voting was heavily favored by Democrats, especially at the beginning of the early voting period, with Republicans disproportionately coming in at the end to even things out a bit. In 2018, the disproportionate use of early voting by Democrats has held steady for the past week. While Democrats are more likely to vote early in 2018 than Republicans, they are less so than in 2014. What this means, interestingly enough, is that although Democrats are more likely than Republicans to vote early in 2018 (at least thus far), the surge in early voting compared to 2014 is being drive disproportionately by a flood of new Republican early voters. What about race? Thus far, it appears that African Americans have taken advantage of early voting at a lower rate than whites. This patterns is in stark contrast with 2014, when there are a significant surge toward early voting among African Americans, and similar to the patterns of 2010. Note that in 2010, and somewhat in 2014, there was an uptick in African American early voting participation as the early-voting period drew to a close. Thus, it may end up being that African Americans use early voting at rates comparable to that of whites in 2018, but it would be a shock to see the numbers begin rivaling those of 2014. For the remainder of the early voting period, I plan to update the three graphs that are reported in this post. It will be interesting to see what these numbers go. Because early voting only accelerates as Election Day approaches, it is safe to assume that early voting this year will be of historical proportions by the end of the week. 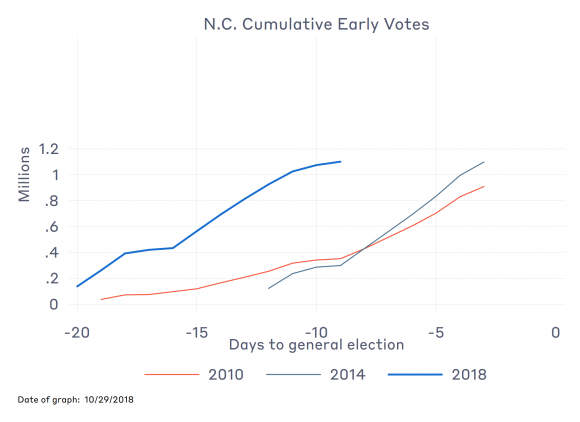 If the early voting rates match the 2016 rates, Election Day will be pretty quiet in the Tar Heel State, even as voting has changed significantly. This entry was posted in Uncategorized on October 29, 2018 by cstewart. I was quoted this morning in a story by Alexa Olgin from WFAE in Charlotte about the start of early voting in North Carolina. This gives me a chance to dig out some old research I’ve done on the North Carolina legislature’s past actions to restrict early voting hours in the Tar Heel State, and to state why I believe the most recent change in early voting hours will inconvenience voters and waste local tax dollars. Last summer the legislature changed North Carolina’s early voting law to mandate that all early voting sites that are open on a weekday have the same hours, 7 a.m. to 7 p.m. Supporters in the legislature maintained that the purpose was to reduce confusion about when polling places would be open. Unfortunately, in all likelihood, the law will increase congestion (again) during early voting. Before proceeding, I need to lay out two facts, in the interest of full disclosure. First, as almost everyone reading this blog knows, my major message in the elections world is that data’s our friend. Whether voters are confused about early voting times in North Carolina is an empirical question. I know of no direct evidence on this point. The fact that North Carolina was fourth in the nation in 2016, in terms of the fraction of votes cast early, suggests that a lot of voters have figured it out. In the face of limited (if any) direct evidence of early voting confusion, we have to weigh the practical impact of requiring uniform hours that stretch for 12 hours starting at 7 a.m. 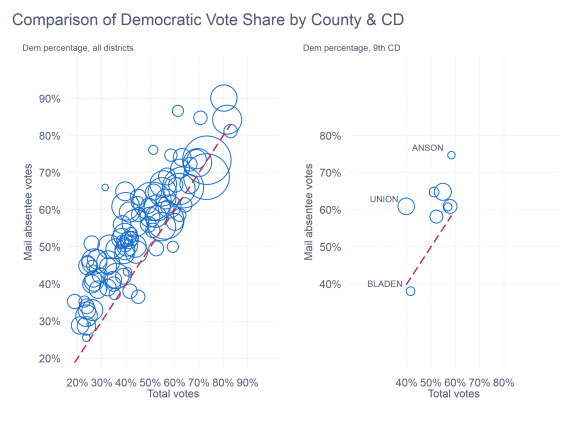 In 2014, when counties were essentially required to do the same thing, relatively few voters took up the counties on their offers to vote earlier and later in the day. It’s likely the same will be the case in 2018. Second, as some people don’t know, I served as an expert witness on behalf of the U.S. Department of Justice when it sued the state over changes to its voter laws in 2013, including a reduction in the number of days available for early voting. In my role as expert, I filed a few reports about the likely effects of changing the early voting laws. You can read the relevant reports here and here. What is wrong with mandating that all early voting times maintain uniform hours of 7 a.m. to 7 p.m.? The main problem is that most early voters don’t utilize the earliest and latest hours of early voting. In both 2010 and 2014, the last two midterm elections, three-quarters of weekday early votes were cast between 10 a.m. and 5 p.m.; 90% were cast between 9 a.m. and 6 p.m. Readers may recall that North Carolina’s legislature passed a law in the summer of 2013 (HB 589, or VIVA, for “Voter Information Verification Act”) that reduced the number of early voting days from 17 to 10. It also required that counties maintain the total number of hours of early voting in 2014 as they had in 2010. The law was invalidated by the Fourth Circuit Court of Appeals ahead of the 2016 election, but was in effect for the 2014 election. Thus, we can see what happened the last time the legislature tried to mandate to the counties when they offered early voting. Counties could do one of three things to comply with VIVA’s early voting provisions. First, they could ask for a waiver, and not offer as many hours in 2014 as in 2010. Second, they could just increase the number of hours their early voting sites were open without adding any additional sites. Third, they could increase the number of early voting sites and keep the hours the same. What did the counties do? A few requested, and were granted, waivers. On the whole, though, counties adopted a mix of the last two strategies, although it was heavily weighted toward expanding and shifting hours in existing sites. First, the number of hours allocated to weekends increased by 55% while the number of hours allocated to weekdays declined by 7.6%. Did early voters respond by “going to where the hours were?” Yes and no. 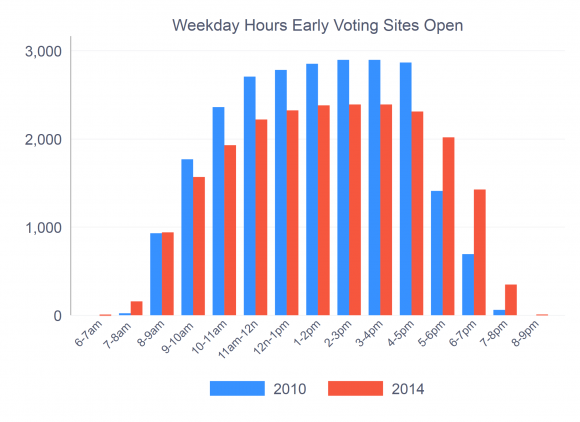 The accompanying figure shows the hours of the day when early voters cast their ballots in 2010 and 2014. 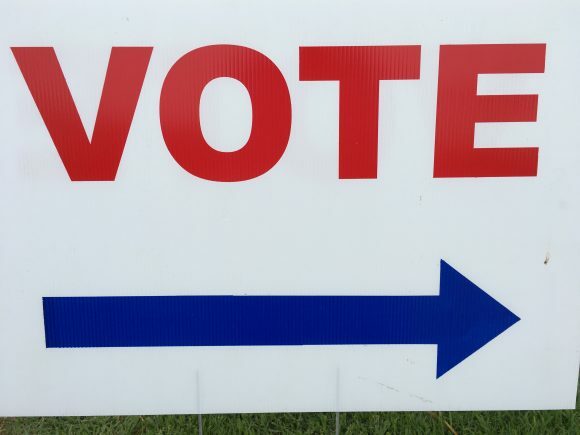 It is true that many more early voters cast ballots after 5 p.m. in 2014 than in 2010. It is also true that more early voters cast ballots during the 9-to-5 period, as well — the period when counties cut the number of hours. 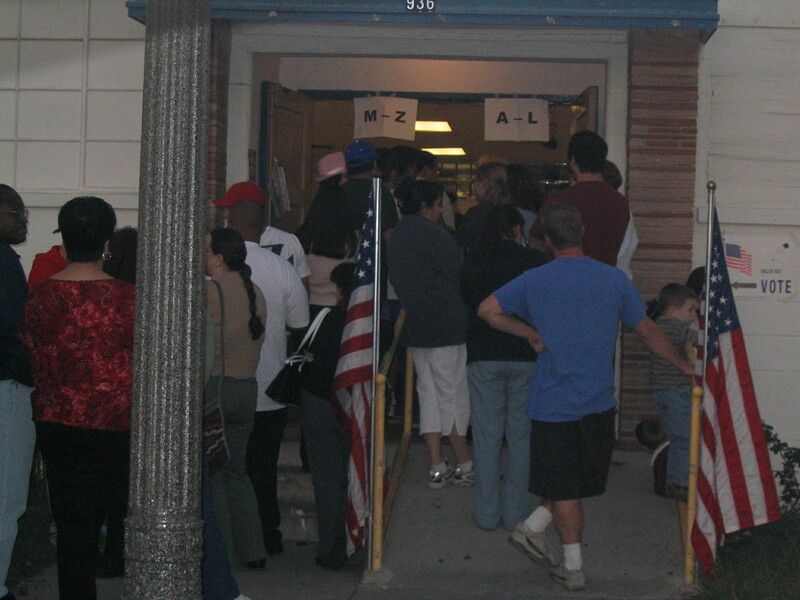 The result was that the state did not meet the demand for early voting when the voters wanted it. Between 2010 and 2014, the number of 9-to-5 early voters increased by 9.9%, despite the fact that the number of hours offered for early voting fell by 17% during these hours. The result was to create an over-supply of voting times available for after-hours voters while doing nothing about the under-supply of mid-day times, or reducing the over-supply that already existed for voting very early in the morning. 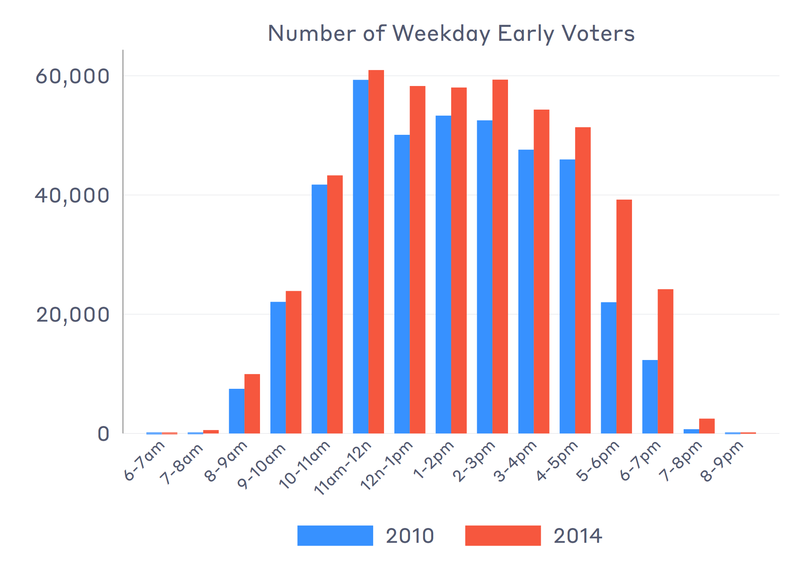 This mismatch of the supply of early voting hours with demand is illustrated by the following graph, which compares the distribution of times when early voters cast their ballots with the distribution of times when the early voting sites were open. Note that in 2010, hours available exceeded voters voting up through 11 a.m., at which point the ratio of available hours-to-voters shifted. This imbalance remained until around 3:30, when supply-and-demand evened out. In 2014, the over-supply of early-morning hours actually increased a bit while the under-supply of early-voting hours remained. And, what had been a good match between supply-and-demand after 5 p.m. became an over-supply of available hours in 2014. In short, the response of counties to the legislative mandate was to shift hours to times when early voters were relatively uninterested in casting ballots while doing nothing about mid-day congestion. The surest sign of congestion is wait times. I’ve worked hard to help states and local jurisdictions match resources to voters, to reduce wait times. What happened in North Carolina in 2014 is an example of what not to do. The simplest measure of congestion at polling places is wait times. According to answers to the SPAE, North Carolina’s are among the longest in the country when it comes to early voting. In 2014, North Carolina’s average early-voting wait time was 8.5 minutes (+/- 2.9 min. ), compared to 4.2 minutes (+/- 0.4 min.) in the rest of the nation. In 2016, North Carolina’s average early voting wait time was 18.9 minutes (+/- 5.1 min. ), compared to 12.4 minutes (+/- 1.0 min.) nationwide. So, while there is no hard evidence that North Carolina’s voters are confused about the times when early voting sites are open, there is evidence that North Carolina’s early voting sites are congested, and more congested than the rest of the nation. One source of this congestion is probably the under-availability of early voting hours in the middle of the day during the week. Forcing counties to offer more early voting hours before 9 and after 5 not only strains county budgets, but it requires counties to exacerbate existing congestion problems. There is (at least) one important caveat here: The analysis I’ve offered is at the state level. Important decisions about early voting are made at the local level, even when the legislature imposes mandates. That means that the problem of the mismatch between the supply and demand of early voting during the day varies across counties. In some places, the problem will be worse than I describe here, but in other places, it will be better. One thing seems to have been missed in all this effort to mandate when counties offer early voting in North Carolina: most early voters are not trying to accommodate their work schedules on the day they vote. In 2014, I was able to do an over-sample of 10 states as a part of the Survey of the Performance of American Elections, one of which was North Carolina. In these states, I interviewed 1,000 registered voters (not the typical 200 in the regular nationwide survey) and asked them about their experience voting. Thus, I had a healthy number of early voters in North Carolina (353) to talk to. One of the responses categories was “I did not have work or school the day I voted,” which 64% of early voters chose as a response. This compares to 52% of Election-Day voters. A disproportionate number of early voters were retired (32%) or permanently disabled (11%), compared to 23% and 5%, respectively, of Election-Day voters. It is hard to believe that the expansion of early voting hours will drive retirees and the physically disabled out of the early voting electorate, nor will it bring in more full-time workers, who were not enticed to vote early in 2014. North Carolina has gotten to be known as the place where the legislature is happy to make changes to the state’s election laws and then leave it to the state and county boards of elections to figure out how to implement them. The early voting mandate from this summer fits into this category. While I am the last person to argue that state and local election boards make the right decisions all the time, I think that, on net, the evidence has been that county election boards in North Carolina have been trying to balance fiscal responsibility with demand for early voting within their localities over the past several years. 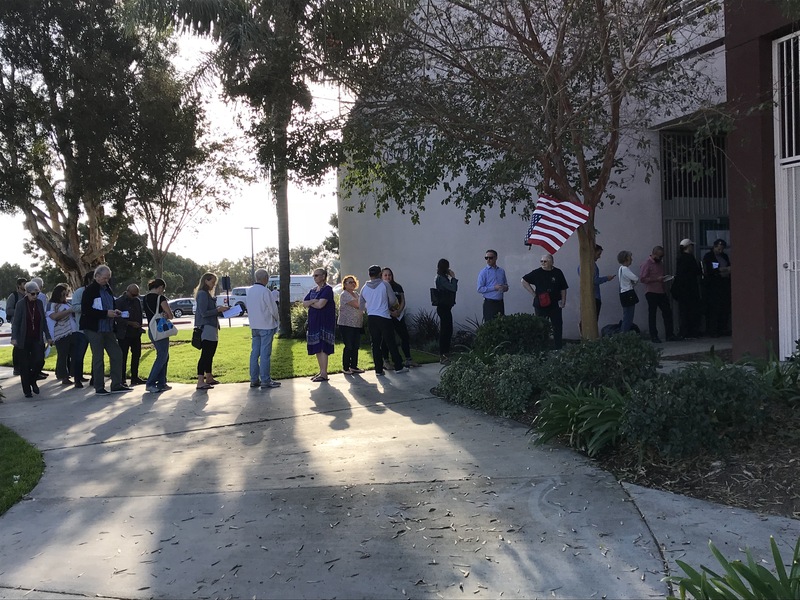 The blanket requirement that counties expand early voting hours to under-utilized times of the day undercuts these local good-faith efforts. Of course, the evidence also suggests that some county boards have been under-providing hours in the middle of the day. It would be nice if the legislature would turn its attention to that problem. And, it would also be nice if they paid for it, too, but that’s another topic for another day. Finally, am I predicting an early voting disaster in North Carolina this year? No. Midterm elections are low turnout affairs. Even in this year when political interest is up, North Carolina has no big-ticket items on the statewide ballot. The most likely outcomes to the added congestion and mis-match of supply-and-demand for early voting hours will be minor inconveniences in most places. This entry was posted in Uncategorized on October 17, 2018 by cstewart.